MUZAFFARABAD: Journalist from across Azad Jammu and Kashmir (AJK) on Wednesday staged demonstrations in front of the Indian High Commission in Islamabad to protest against the brutal killing of prominent journalist Shujaat Bukhari in Srinagar. They also handed over a memorandum to the United Nations Military Observer Group for India and Pakistan (UNMOGIP) stationed in Rawalpindi and demanded a UN probe into the gruesome murder. 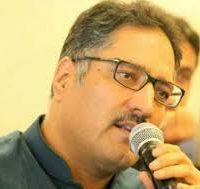 Shujaat Bukhari, the editor of Rising Kashmir, one of the region’s leading newspapers, was killed last Tuesday in Srinagar as he was leaving the office in downtown Srinagar, when the gunmen attacked his car.